It’s been awhile since I’ve participated in showing off foliage after bragging about blooms, but today I’m glad to join in with Pam at Digging for Foliage Follow-Up. Additionally, June 15-21 is Pollinator Week and along with fab foliage, we’ll take a look at a few of the many pollinators that happily and diligently work for free in the garden. Many of my native Texas perennials shoot forth in foliage growth during wet years and this year is no exception to that general rule. 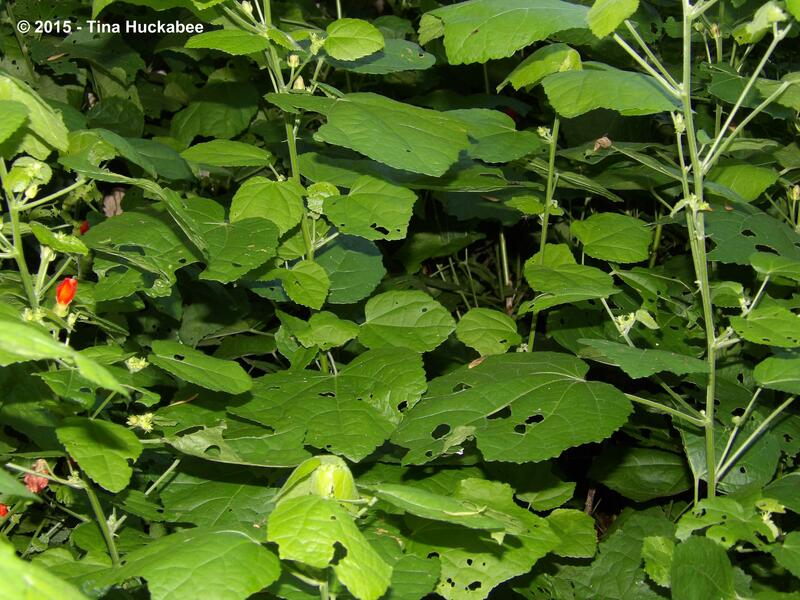 The leaves of Turk’s Cap, Malvaviscus arboreus, are wide and lush and a bit holey, due to munching insects abundant this spring and summer. I don’t really mind the chunks taken out because those eating machines do little damage to the plant as a whole. The Turk’s Cap flowers are good for pollinators like this hummingbird who happily nectared last fall in preparation for migration. 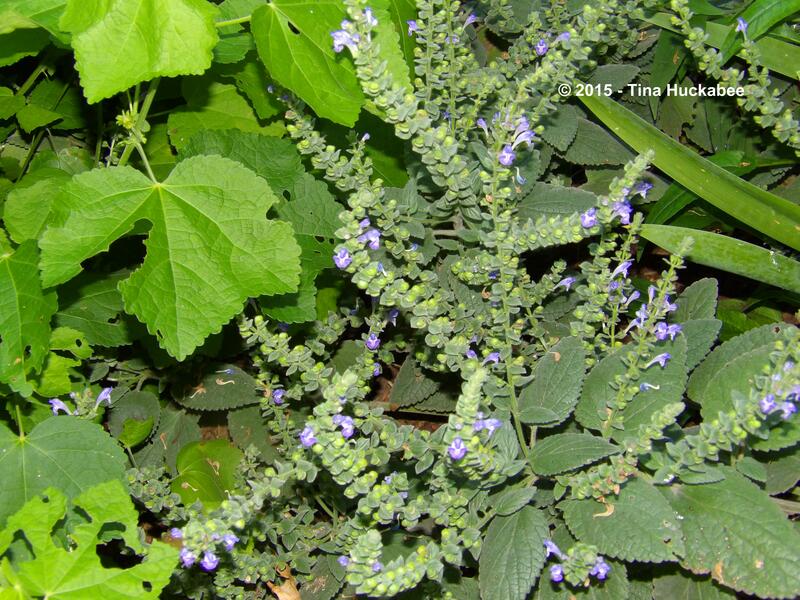 …and the gray, aromatic leaves of Heartleaf Skullcap, Scutellaria ovata. Both Flame Acanthus and Heartleaf Skullcap are excellent pollinator plants. Oops! That damselfly visiting the Flame Acanthus is a beneficial insect in the garden, but not a pollinator. 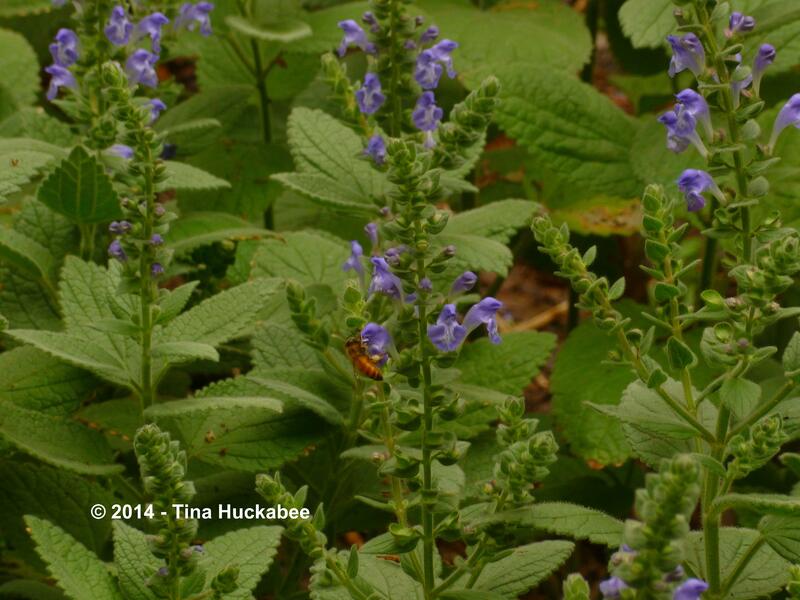 On the other hand, Ms. Honeybee, nectaring on the Skullcap, is certainly a pollinator worth cheering on. The sandpaper-rough, dark foliage of the perennial Goldeneye, Viguiera dentata, pairs nicely with the soft, ruffly foliage of Globe Mallow, Sphaeralcea ambigua. …attract all kinds of pollinators and both are favored by native bees. 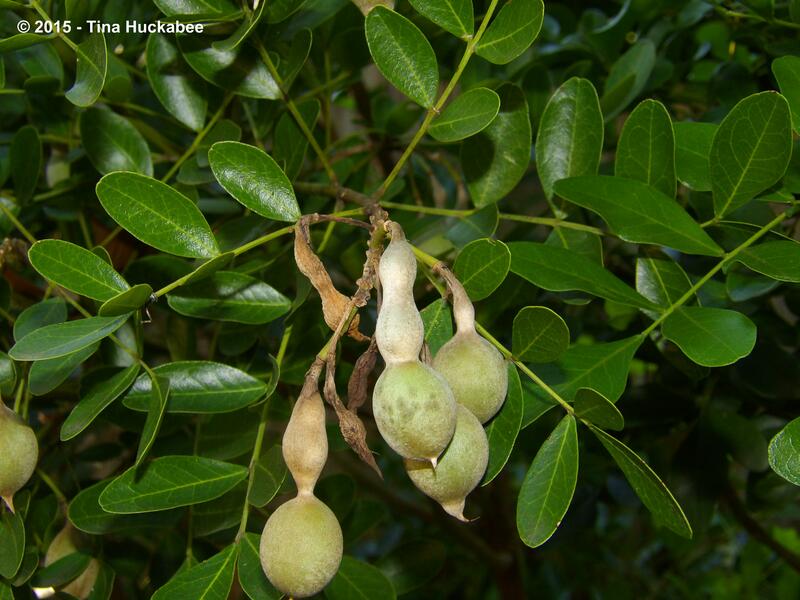 Mountain Laurel, Sophora secundiflora, is a beautiful tree year-round. Waxy, softly rounded, evergreen foliage perfectly augments the lusciously drooping clusters of spring flowers, which are visited by many kinds of pollinators. 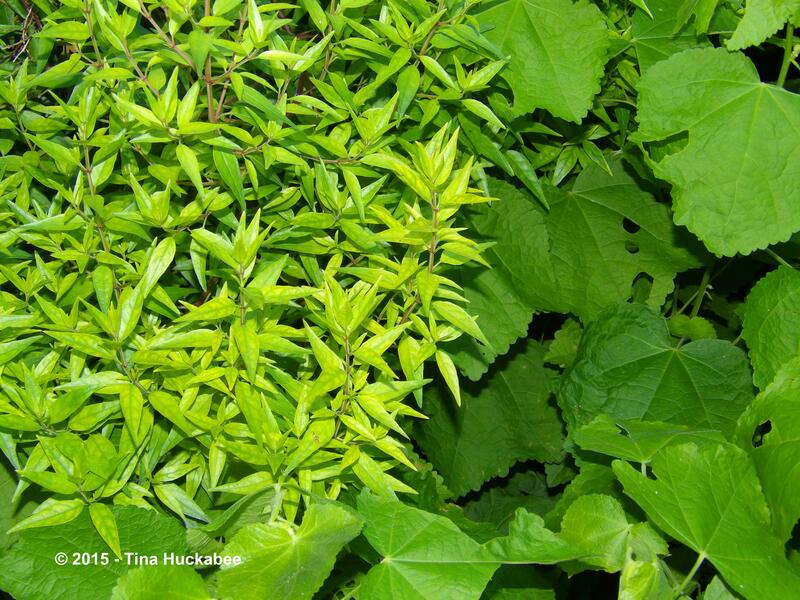 After the blooms have ended, the foliage is attractive–really attractive. Mountain Laurel blooms are stunning, but the abundant and verdant foliage, as well as the graceful form of this tree is its selling point for me. 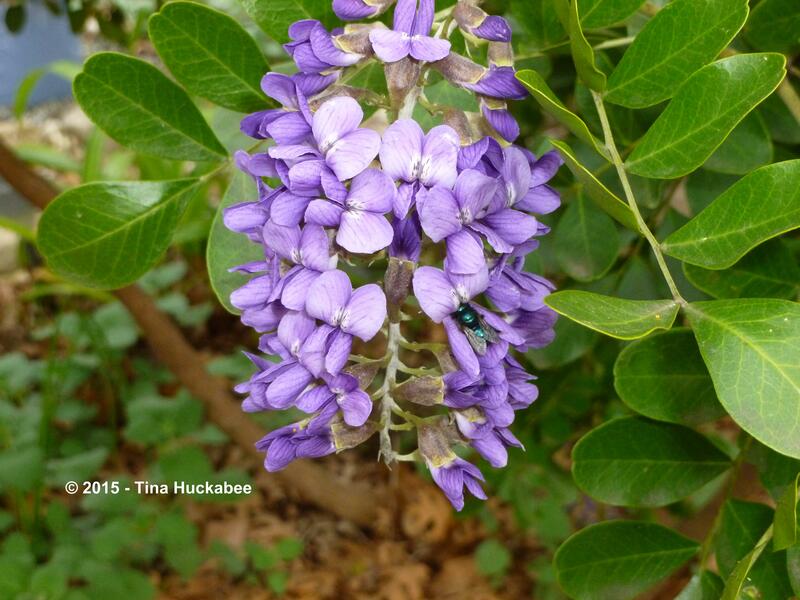 Mountain Laurel is a winner–in the urban garden or viewing on a hike in the Texas Hill Country. Finally, this ‘Sparkler’, Carex phyllocephala, has no value to pollinators that I’m aware of. But I’ve welcomed it and two more to my gardens. 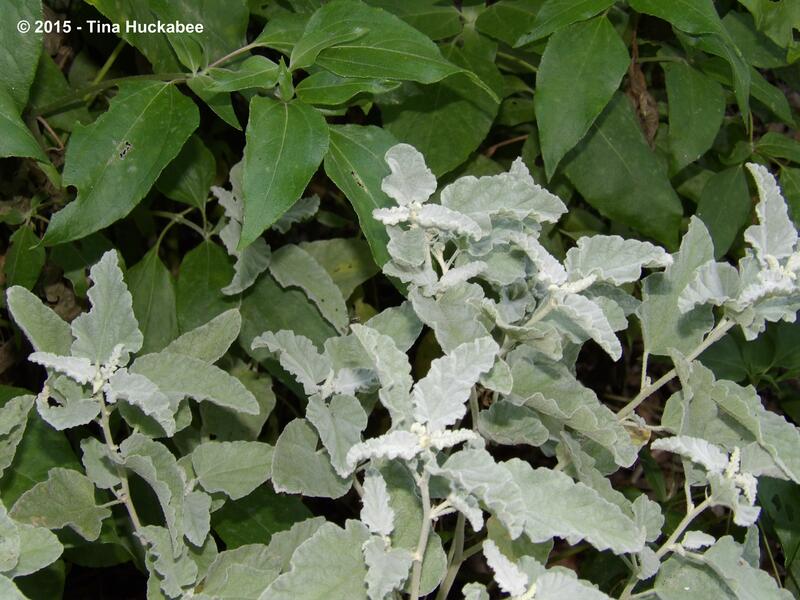 It’s cheery–downright sparkly–evergreen and white, as well as drought tolerant. What more could you ask from a foliage-driven plant? What are your leafy greens (or maybe purples? reds?) doing this June? Show them off and then pop over to Digging for a look at foliage shared by other gardeners. This entry was posted in Foliage Follow-up, Pollinator Week and tagged 'Sparkler', Anisacanthus quadrifidus var. wrightii, Carex phyllocephala, Flame Acanthus, Globe Mallow, Goldeneye, Heartleaf Skullcap, Malvaviscus arboreus, Mountain Laurel, Scutellaria ovata, Sophora secundiflora, Sphaeralcea ambigua, Turk's Cap, Viguiera dentata by Tina. Bookmark the permalink. 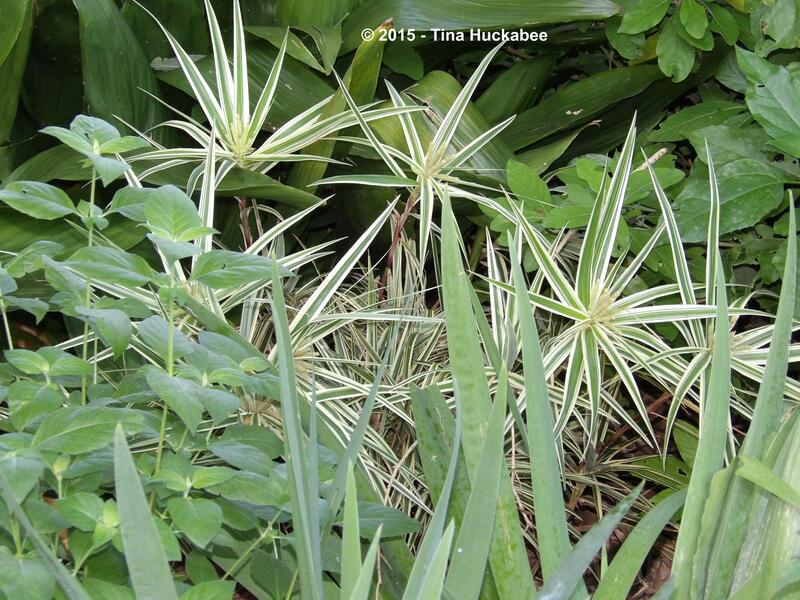 There are lots of foliage winners in this lineup but that sparkler Carex is stunning. I’ve got a similar color combination in Aztec grass but it doesn’t stand up and demand attention quite so effectively. I definitely see the attraction! Isn’t the Sparkler pretty? I first saw it on Digging, but it wasn’t until I was trolling the rows of BSN looking for just the RIGHT plant, that I saw it in real life. I try to always buy or trade for plants that feed something at some point of the year, but I make exceptions to that rule. Sparkler is one of those exceptions. I love the mountain laurel flowers, makes me think of wisteria. 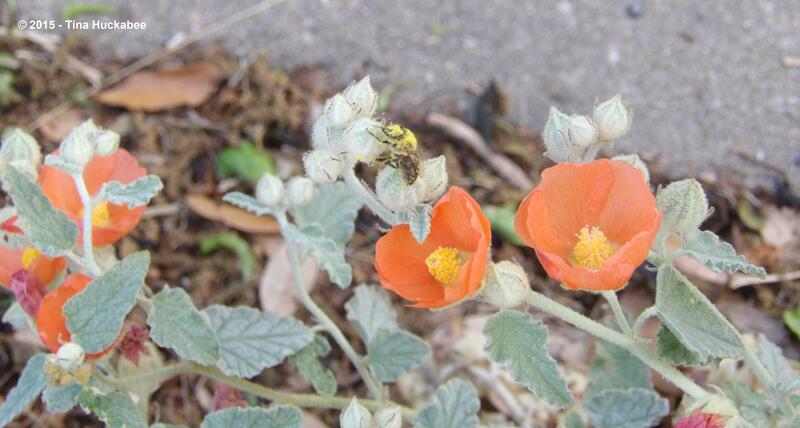 I also really like the globemallow – you can see how the flower buds are like hollyhocks. How tall do they get? The laurel flowers do resemble wisteria in some ways with the cluster and color. My largest globemallow is about 2.5 X 3. It’s a plant that wants to bake in the full sun, so nothing but will do. In the right spot though, it’s a lovely shrub. Thank you for sharing the foliage with holes! It made me want to give you a hug. I am share and share alike. I have made peace with my leaf holes long ago! I am curious who does it….I have hostas in pots on the porch so I know that snails are not eating them. Just wondering who! Well hugs right back atcha, Laurin! That’s so funny. I’m very suspicious of gardeners who don’t have the natural imperfections that plants will have–granted, some years more than others. Either the gardener is being dishonest or using chemicals that are damaging to the garden and its inhabitants and the environment in general. I know I’ve had some snails this year (thanks rain), but I also suspect leafhoppers and some kinds of grasshoppers, (probably thanks rain there, too). Mostly, the holes are on the Turk’s Cap and Blue Mistflower foliage, though my Gregg Mistflower is untouched. Are you getting soaked in Houston? We’ve had rain on and off all day–more to come…. Not nearly as much rain as predicted, but the night is young! I like the foliage combinations that you show with the Turk’s Cap. It seems like a workhorse in your garden–for visual appeal and pollinator support. Nice post! Thanks, Beth. 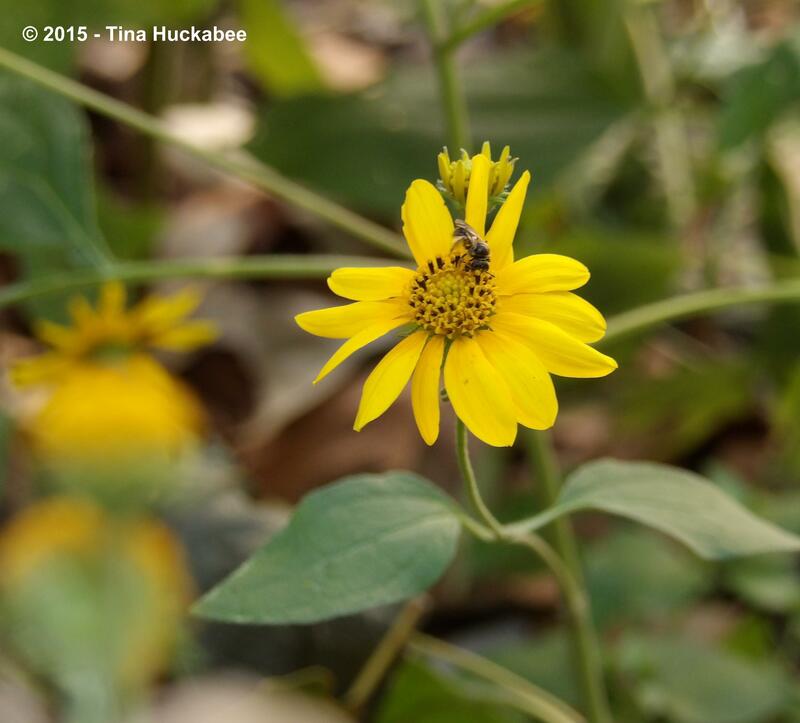 I call the turk’s a “staple” in my garden- it anchors my beds and is undoubtedly a favorite of the pollinators. 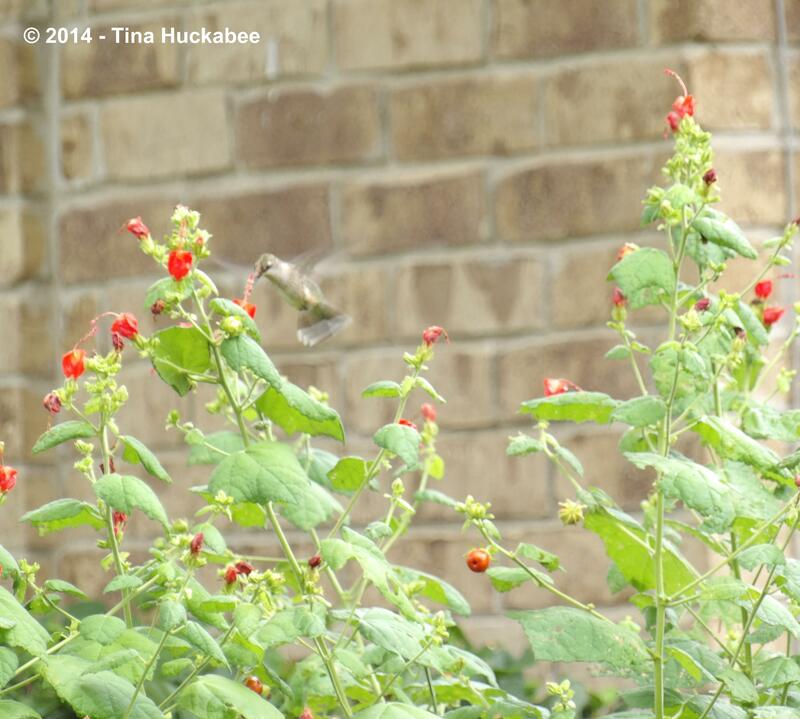 This has been a good spring/summer for Turk’s cap- your hummingbird looks happy! I’ve seen a fair number of hummers through the garden, but haven’t been able to snag a photo. I had to get a stock photo. How have I missed the Carex ‘Sparkler’?? Thanks for sharing, it’s on my list now! Hi Wendy! This Carex doesn’t seem to be all that commonly available. I got mine from BSN, but I’ve asked other places and they had no idea about the plant. It is a nice one for structure and I’ve been pleased at its water-wise-ness. 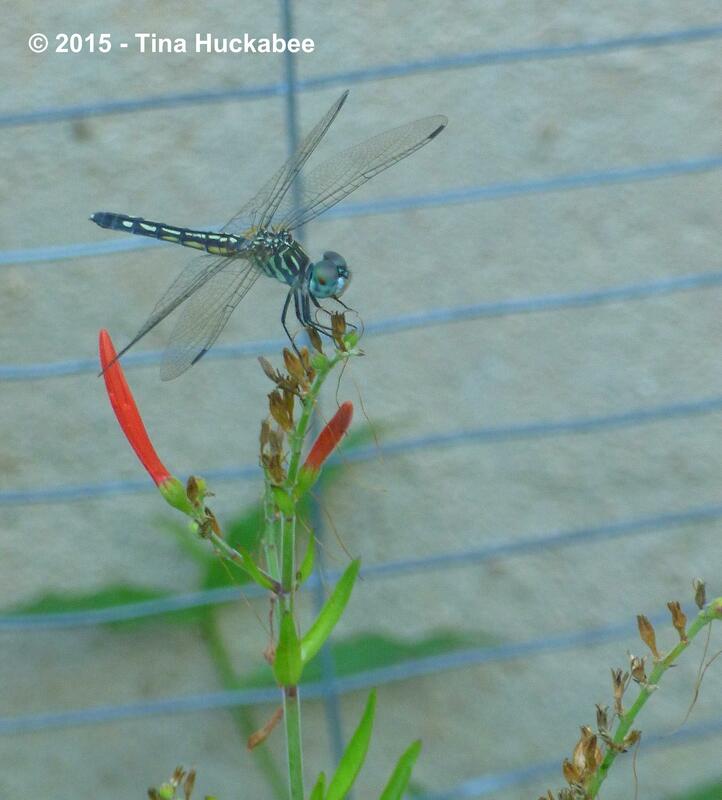 Lovely post Tina, gorgeous photo of your Damselfly too. I am still getting used to the names you use over there for your plants, they contour up great images. Thank you, Julie. As I recall, that that blue fella is a Blue-eyed Darner, Aeshna multicolor. There are so many different species in the Odonata family who visit my pond that IDs can be tricky, though I think I originally got that one right. Beautiful foliage, Tina! I love the deep yet bright green of your Turk’s Caps. Ours are “holy” too, thanks to the bugs, but have not yet begun to bloom. Your pollinators appear to be having a heyday. Your photos are great. The Damselflies seem to be much more abundant, at least in our neck of the woods, this year, due to all the rain I guess. 🙂 Your plant combinations are very attractive! Thanks for sharing your foliage! Thanks! The Turk’s does have nice foliage, tropical in looks, holey though for this summer. Bugs!! I’ve also noticed more dragons and damsels this summer, but I do have a pond, and they’re just about always flitting about. I hope we’ve all learned something from the drought. Unfortunately, we live in a society where things tend to be quickly forgotten, which is not always a good thing. A lot of people clamored for an end to all restrictions, which is what the city council and the water board did this week. Though they’re re-working the drought policies regarding what restrictions apply under each stage, moving up the points at which each stage goes into effect (such as, instead of a certain stage going into effect when the lake levels reach 50%, it would go into effect at 55% in the future), etc., the only restriction now in effect concerns what time of day folks can water their yards (6 PM to 10 AM, I think). This has been a permanent restriction for years, so its nothing new. I was outside yesterday evening and heard a whooshing noise…the sprinkler system at the corner a block up had come on, apparently right at 6 PM on the dot. No one has lived in the house for about 5 years (an elderly couple who owned it passed away and a daughter in OK now owns the house), but alas, the St. Augustine lawn has to be bright green! And I’m sure the water just ran into the street because the ground is too wet to hold any more moisture. Duh! There are always those who will abuse the privilege — and I think in this day and time having water has fast become a privilege — not considering that history tends to repeat itself. They also tend to be the first ones to complain when that privilege is taken away or restricted. You can’t change human nature. But I think the majority of folks understand the situation and have learned from it. I will say we have a pretty good group of people managing our city and the water situation. They’ve taken a lot of flack at times but because of them we were able to keep our heads above water (pun intended 🙂 ! ), and they’ve really pioneered some great work that other communities not only here in Texas and the US are interested in, but overseas as well. They’re continuing with the temporary projects that had already been put in place, such as the water re-use project that cleaned and purified the sewer water and dumped it back into one of the lakes. That pipeline is being disassembled and a permanent pipeline for treating this water will be constructed. Instead of being able to purify about 5 million gallons of water per day for re-use, it will be able to handle 10 to 11 million gallons a day. Okay, probably more than you wanted to know! But I think most folks here are encouraged by how we got through the last four years, and how the city is going about making sure that any future drought won’t have such a devastating effect. I’m glad you replied! You’re so right about those who abuse privileges are typically the ones who most complain. I’ve seen the same thing here: neighbors spewing out water when we’ve had buckets dropped in these past weeks and nothing need watering. Very frustrating that. I’ve noted that the American psyche is remarkably forward thinking in many ways and we have this “can do” attitude–and that is a great quality, with some moderation. What we do though, is forget mistakes and blunders, only to face the same challenges again and again. And again. Witness the news of the last 24 hours, or so. Still, I’m glad your city leaders are good–I’ve certainly been impressed with I’ve heard one or another interviewed. Austin could learn some lessons! Thought they were strawberries at first! Was rather envious of how ripe they looked…. Ha Ha! I’m afraid we’re way past strawberry season here! 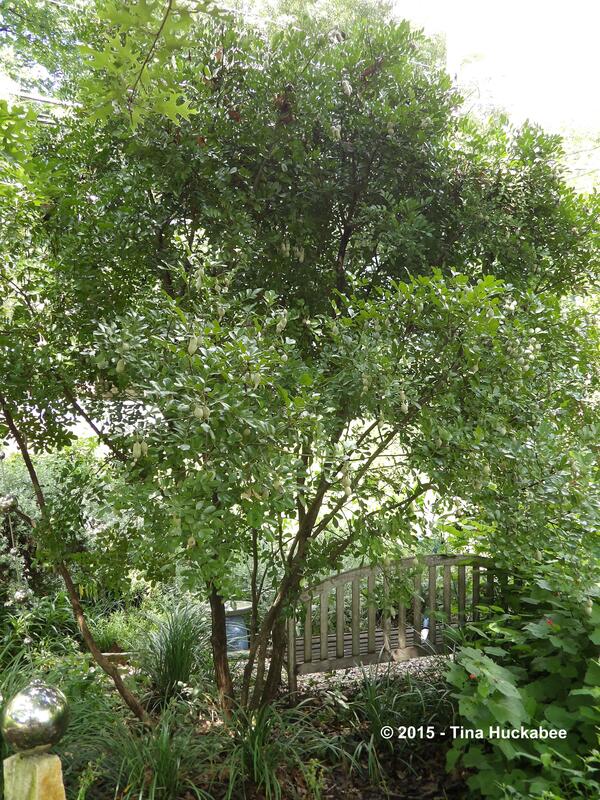 Sophora secundiflora is really one of those perfect plants. Right size fragrant, nice leaves, graceful form … I just love it. And I LOVE your bees. For breakfast this morning a slice of toast with some of the honey you generously passed along. SO delicious. I thought: this reminds me of something. And then I realized what. It reminded me of what honey tasted like when I was a kid. wow. Thanks once again. It’s a great tree, no doubt about it. I LOVE my bees too! I’m glad you liked the honey–it’s pretty great! Actually, I checked the hives this past weekend and accidently broke a comb, so we’ve pulled off the first of the spring honey–about 2 cups. Mufasa has a full top box of gorgeous, heavy honey. I know what I’m doing this weekend…. I’ve added several patches of scutellaria and the pollinators love it. They go completely nuts for the stachys ‘Hummelo’, too. I love that tree but don’t think it grows in my area. Dang it! Great! I’m not familiar with the ‘Hummelo’, I’ll have to look it up. No doubt you can grow a tree equally as beautiful as the Mt. Laurel in your neck of the woods. Turk’s cap is one of my summer foliage faves too. I mean, those big leaves! And they can still take summer’s heat and drought — or wetness, as the case may be. Thanks for joining in with your faves. 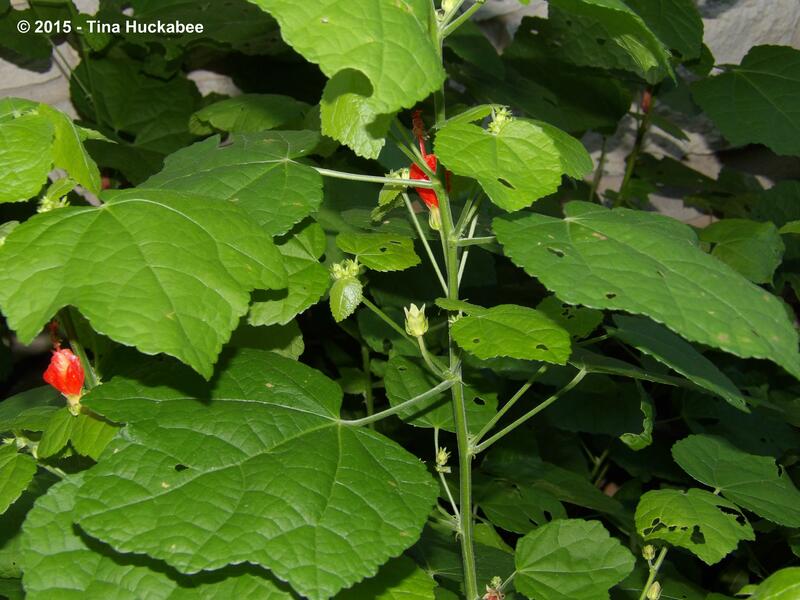 Turk’s Cap is a great summer plant! Thank you for hosting! They’re out in full force now–and so interesting.